it is possible to be firmly optimistic. We can have peace in our lives even when there is turmoil around us. Many people who are unhappy are fighting God. When we fight God, we are walking a path full of darkness where we are stumbling and can never quite have victory over our problems, On this path, we cannot find a successful plan to live. When we live the principles of the Bible (principles of life, love, justice, peace, goodness, righteousness, etc.) our path is clearly lit by the living Word. Those who fight for good causes that help save people's souls and people's lives, though somber and concerned, experience happiness, knowing that they are in alignment with God's will. In contrast, those who fight against the the commandments of God, are bitter, frustrated, resentful, unhappy, and discouraged. True happiness comes from doing what is right. To develop the habit of happiness, try this: do a task that you have been putting off for some time, such as cleaning a shelf or drawer or room--or even the garage or yard, that has been bothering you for years, or clean off your front porch and decorate it in a welcoming manner. These simple things often bring the greatest happiness. Even when life is good, many people experience depression. They cannot seem to identify why they feel so low. Our moods are made better by learning to seek loveliness and beauty in our lives and doing good things for others, rather than looking on the dark side of everything. When you get up in the morning, do you immediately think that it is going to be another trying day, or do you look for the opportunity to make it a better day than previous days? Do you take mental note of the mistakes of the previous days, and learn strategies of avoiding such errors? If you will look for the good that can be done today, you will be able to look back on the week, just as God looked on the Creation, and say that "it is good." In a month you will see that things have changed in your life. As the years go by, you'll see that you have not only been happy, but you have done something worthwhile. What kind of story will your life tell? A story of despair and disappointment, or a story of courage and fulfillment? It all depends on whether or not you will adopt the thinking habits that determine what you do or do not do. Will you go through your life being picky and critical about everything that is good, digging for flaws in people's lives? Most people will avoid such acquaintances, and if we continue in this behaviour, we will feel less and less happy. Everyone who has ever lived, has experienced troubles. The greatest battle to fight in life is discouragement. In the mornings when the weather is dim, rainy, cloudy, and cold, we can either look at it and let it affect our mood for the worse, or we can look at it as a wonderful painting, full of mystery; weather that is designed to make the grass greener and the countryside well-nourished. We can have happiness knowing that such uncomfortable weather affords us more time indoors to do things that ought to be done, without the lure of recreational activities. Being constantly critical or thinking of the dark side of everything, can rob our hearts of happiness and create discouragement. Try for one full day not to criticise or complain, and see if your mood is elevated. Have I helped someone or given some encouragement to someone else? Have I eaten right? (Too many sweets and caffeine can cause anxiety: some chocolate has caffeine in it). Have I looked my very best today? Have I learned something today? Have I improved myself in any way today? Is my house clean, orderly, and beautifully decorated? To keep discouragement from crippling your life, just remember that life is part good and part bad, and it has its ups and its downs. The weather is sometimes cold and sometimes hot. Our financial situations are sometimes comfortable and sometimes too tight. We can recover from all this and move on, but it does not mean that we can completely escape these conditions in life, for they are part of life. What we can do is determine to be encouraged and to succeed in our purpose in life. To fight off discouragement, sometimes we must "grin and bear" things, or "smile though the heart is aching." The people before us did it, but somehow, we may have been led to believe that it is better to wallow in self pity and melt into a puddle of gloom when troubles come upon us. As you practice smiling through troubles, you will eventually overcome depression. There are things that feed discouragement, that we must leave behind us: depressing words of certain music, reading materials and friendships, and depressing things to look at. Surround yourself in beauty, and you will find that you have fewer days of unhappiness. As we grow older, we must remember that others are watching us to see how we handle problems, and that also we are leaving a record or "history" of what we do. Will we be embarrassed about the way we carried on about problems, or will we be glad that we did not cave in to discouragement? We live in an era where people have been encouraged to "vent" and air every personal problem, rather than practice the restraint that was more dominant in people in past centuries. To gain control of ourselves is a wonderful mark of strength. One of the best ways to begin this self-control is in the area of fighting discouragement and practicing a life of happiness. To practice the kind of self control that was characteristic of our forbearers, try this: In the gloomy moments, force yourself to smile, and think of something very good. It will not be easy, but the doing of it will eventually make you the boss and the mood the servant! Happiness does not come from external circumstances. It can be had just by changing the mind! I once read of a young man who did not come from a happy home, who would escape by himself to draw and paint. He painted houses that he imagined happy families lived in, and he created his own world in his mind. He fought discouragement by being creative. 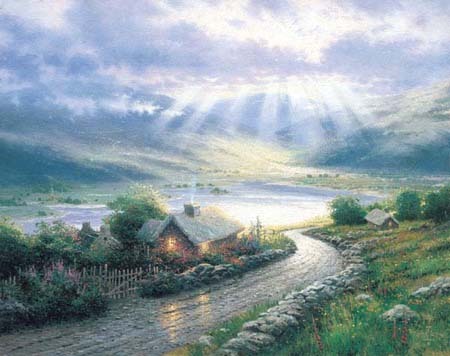 You know him as Thomas Kinkade, the painter of light. He wrote that the light of a fireplace or candles in a home was a warm, golden light, while the light of the modern screens was blue. He captured that warm light in his beautiful paintings. Another boy from a very poor family, used to take walks in old neighborhoods of Victorian homes in the South. He learned to love architecture. One day an architect noticed him and helped him learn to design homes. His is known as William Poole, and publishes a regular periodical which you can buy called "WIlliam Poole Designs." In both these cases, people kept hope alive in their hearts by pursing a strong purpose in life. If you want to have a purpose in life, than pursue it with all your heart. Gird yourself up with determination, and fight off discouragement. If you want to have a lovely, functional house and a happy home, then don't let discouragement rob you of that happiness. Gather around you the tools and learning materials you need to accomplish your goal, and go to it. Fight off discouragement by substituting good productive thoughts for the old, defeating thoughts. Keep hope alive, and keep the sun shining in your heart. If you are persistently unhappy, then check into your relationship with others and with God. You may be sufferring from unresolved conflicts. Make things right with everyone, and submit to your authorities in life, and you will find favor with them. The jitters will go away, and you'll be free to be happy, at last. Live each day as though it were your last. Be pretty, be cheerful, be happy. Remember that God is writing a book of all your words and deeds. Practice only the things you want recorded. Ask forgiveness of wrongs and let God erase them from the story. Others are watching you too: your little children, your husband, your parents and siblings, and your spiritual sisters and brothers and church authorities. You can either encourage them or discourage them by your countenance. If you want to be happy, then do the things that will bring happiness: do what is good and right. One of my loved ones recently told me that he was feeling on the down side for quite awhile and could not understand it. After finding employment that he liked, the feeling went away. It is true that we can live without so many material things and be happy, but a man must not forget that he has an obligation to support his family. As we add more comforts to our lives from the money that is earned, our responsibility to others certainly increases. The rich are warned, in the New Testament, to also be rich in good works. As we increase in good works, our happiness is also increased. Another person said that once she began to send out cards and letters to people just to cheer them, her mood was improved. Your countenance and mood is often in direct relationship to the things that you do and the thoughts that you think. Think on the good side of things each day and try not to let gloom and discouragement creep in. Fight them off mentally. Happiness will not abide in a soul that is full of dark and gloomy thoughts, so think about your future, and be happy. Happiness must be found in the home. The home is a source of rich culture and learning. When we realize this, we can be much happier. Samuel Johnson, the author of the first English dictionary, said, "To be happy at home, is the ultimate result of all ambition." We must earnestly strive to keep our homes free from the problems this world offers, and make them sweet havens of safety and rest. This is largely in the hands of the woman, for no matter where she lives--whether it is a tent or a mansion, she naturally wants to make it a nest full of good things that make a home feel homey. My friend and sister in Christ is is visiting me from Australia, commented that when we see something cooking on the stove top, we automatically want to stir it. When we see a baby we want to pick it up. When we are visited, we want to serve them something to drink. If we will allow it, these natural instincts will return to our lives, and make us much happier. Look on the bright side of things. Every cloud does have a silver lining. Though evil surrounds us, our triumph is in the fact that God has provided an avenue to be happy: think lovely thoughts and do what is right. What kind of upbringing did Michael Shiavo have, and who are his parents? His actions are a reflection on his upbringing. Perhaps they did their best to instill good principles in him, but he was left in the care of institutions to follow them at his own will, or to be influenced by others. Our mid-week Bible study is led by a very wise, elderly man. We were discussing the scripture about honoring parents. He made some insights into this by asking the question, "How long does one honor his parents?" Through careful search of the scriptures, we discovered that it was very dishonoring even if an older person, whose parents had passed on, lived contrary to his godly upbringing. In other words, if a man in his thirties became rebellious to the values of his Christian parents, and decided to go the way of the mainstream world, and if he was aware that it would hurt his parents while they were living, it is still a violation of this scripture, and a violation of his conscience. Many people grow up in good Christian homes, but when they leave, they get under the influence of people who think that they were deprived of "the real world." These grown children then entertain themselves with things and friendships that would have aggravated and grieved the parents tremendously had they done it at home. No matter how old we get, we always are blessed by keeping to the principles that our parents passed down to us, as they tried so hard to instill in us. They felt their responsibility and were obeying God by bringing us up in the nurture and admonitiion of the Lord. Let us not despise this even when we leave home. With the tremendous energy and mind-power of youth, it is a tragedy that so much of it is wasted in church youth groups. My first experience with a youth group was when I was in my early 20's and was invited to attend a youth group party. I was never at ease the entire evening with some of the things that went on in this group. The first thing they did is play a ridiculous game which involved getting the arms and legs of each person all tangled up with other people, until we all together looked like a giant octopus. I trusted the young minister who had organized this youth group and was sure he was about to use it as an illustration in an important spiritual concept! The game seemed more like something small children would do without trying, while struggling to reach for their own toys. After this the group sat around and contributed complaint stories about all their problems, and in particular, their parents. The leader supposed that attending this group more often would help keep the young people in the church. I can't remember every detail of what went on, but I never attended another youth group after that one time. I just couldn't see what the purpose was. They did not study the Bible, and they did not talk about spiritual concepts, nor did they discuss useful things to do for the church or for others. I consequently did not involve my own children in youth groups. Occasionally they were sometimes introduced to such things, through various circumstances, but I never saw that it enhanced their spirituality in any way, nor did it increase their Christian maturity. Exposure to the youth group was more likely to give my children unexplainable frustration than it was to ennoble them and give them the tools for mature living or the hope of a bright future. I remember once a minister asked if I would take a turn hosting the youth group meeting in my home. I gladly accepted, thinking "Hmm. Meeting at the home with the family present, is a good thing!" I didn't know that I would be prompted by him to leave the room, along with the siblings of my teenage son. What was the great secret that necessitated the absence of the parents in this group? I asked about it and was informed that kids wouldn't "open up" with their problems when the parents were present. Being a homeschooler, our family was very close and loved to discuss many concepts and principles together. I was very saddenned that the youth group separated the young people from the parents, the very ones that would help them and give them wisdom, rather than turning their hearts toward them. In fact, I think that youth ministers, if they were scriptural and necessary, should be someone like Mr. and Mrs. Stanley Sherman, who have experience with youth in raising their own family. We love being around younger people and we don't like being relegated to our own age group. I am aware that there is a movement away from youth groups, yet there are still some church groups desperately hanging on to the youth group method, insisting that they are necessary. -Are they good homemakers, able to manage a home? -Are they helping their parents? Are their own rooms a mess? Some girls have not yet learned the habit of organization, and are out sitting in restaurants, going to movies, or at the bowling alley with the youth group. -Do these girls learn wise use of time? -Are they learning to be good wives? -Can these girls care for a sick person in their home, such as an aged grandparent? -Can they relieve their mother of the many duties of the home? -Can they hold an intelligent conversation full of wisdom? -While participating in the youth activitites, are they able to be different than the world, in the way they dress and act? _Do the ambitions of the girls in the youth group consist of becoming first and foremost a wives, then a mothers, and keepers of the home? - Can you look at the young men in youth groups and honestly see one as a responsible husband and father? -Are they learning to take strong stands against the world? -Are they dressing differently than the world? -Are they going to the same movies as the rest of the world? -Are they really living up to the full potential that is available to them as young men? -Do they thoroughly know the books of I and II Timothy? Years ago, someone told my husband to read these books every month, to familiarize himself with the Christian attitudes and examples expected of a young man. -Are the young men ernestly striving to honor their parents by exhibiting and practicing the Christian values they were taught? Are they keeping company with girls that their parents don't wholeheartedly approve of? These lists are rather incomplete, but they may help you take a good serious look at whether or not a youth group can accomplish what God wishes for young people. If Christianity is a serious thing, then how can we encourage youth to spend so much of their time with other Christian youth sitting around in each other's houses without older people present, "hanging out" and being silly. As one person recently told me, "They are wading in shallow waters of foolishness, and if they keep on going in that direction, they'll drown." It is true that youth are incredibly frustrated these days, and unfortunately, a lot of it comes from the youth group activities--the very thing that was supposedly designed to help them be "strong in the Lord." God does not need us to develop a special youth group to help the youth. Youth needs wisdom, and wisdom cannot be attained in these groups where they are going to the latest movie, hanging around the apartments of other single people and remaining in their childhood. Some people have admitted that, yes, homeschool families don't need youth groups, but those whose parents are dysfunctional do. I beg to differ. We should not even make such groups available to them. Those whose parents are dysfunctional can find refuge in other families that want to reach out and are looking for ways to serve. If we cover up dysfunctional families by providing artificial groups for them to function in, we won't see the need to raise up good families who will raise up other good families. Youth groups just cover up a problem rather than solve it. I have yet to see one single achiever, inventor, strong family man, or a preacher with a thorough knowledge of the word of God, who was nurtured as a teenager in a youth group. I haven't seen good mothers or homemakers come out of the youth groups. I've never heard anyone say that a youth group was what they needed in order to know how to raise their children or how to behave in the body of Christ. If people insist that youth groups are viable alternatives for youth, then let the youth show their faith by their works: let them take care of the elderly, help their parents, and otherwise be rich in good works. In fact, I have an assignment for your youth group. Give each of them paper and pen and ask them to list as many good works as they can. Then ask them to write down as many scriptures as they can remember. Ask them to write down the ways in which the youth group has helped them be stronger Christians, thoroughly equipped with the knowledge of the Word of God. Then, let's see just how much the youth group has taught them or benefitted them spiritually. Whenever I see a youth group out on the town, I look with sadness, particularly on the young girls. They are wasting their time and potential. They could be making baby blankets for new mothers. They could be learning skills like knitting, sewing, cooking, care of the home, decorating, clothing design, etc. ; things that will equip them for a successful marriage and family. Sitting around with youth groups in cafes and movie theatres is poor preparation for marriage. Girls, if you are in a youth group because you hope to find a mate, you are wasting your time. Youth groups provide too much familiarity between the boys and the girls for their to be any serious spark of interest between them. They often show up in less than their best appearance, which does not endear the boys to them or vice versa. Hanging around a youth group will not get you nearer the altar. My advice is to be aloof from this, and to provide socialization within the framework of your parents and family. Invite special ones that you like to your home and let them see the fruits of your labor. Spend your time in worthwhile accomplishments that will help you function as an adult wife and mother. Take over the house and behave as though you really were all grown up. Youth group activities will not provide the training you need nor the fellowship you need to accomplish the high calling of marriage and homemaking. In reading some of the accounts of young ladies of the past, you'll notice that many of them were able to do adult things while still teenagers. I doubt that the pioneers coming across the Oregon Trail had much time for youth groups. The teenagers of that time were responsible men and women who accepted the roles of men and women gladly. Our modern youth groups fall far short of what young men and women need to accomplish in their distinctly male or female roles as outlined clearly in the Bible. Everyone gets overwhelmed with the work of the home. Discouragement sets in and it makes makes matters even worse. Tiredness, illness, busy-ness, and unexpected interference, can cause us to get behind in things, until the only thing we want to do is run away. I've noticed that the women who love their homes and want to stay in them, are women who are clean and organized. I recently visited the home of a young woman, and I was very impressed with her care of the house. She greeted us as though she were expecting important dignitaries, in her long skirt and lovely blouse, upswept hair, and healthy looking face. As she showed us around her house, I noticed that everything had a purpose for being there. Her papers were hidden inside a roll top desk near her phone. Her kitchen was immaculate, even though I could smell the savory scent of dinner in the oven. She was genuinely happy in her home., but I knew her before she had this home, and lived only in a small, run-down trailer. Inside, her home then had exactly the same atmosphere: neatness, order, and cleanliness reigned. The Bible says, "He who is faithful in little, will be faithful in much." (Luke 16:10) The habits she had formed of making this tiny, poor place neat and clean, helped her take care of the bigger home which she was to live in years later. Many women are using the inconveniences they face (no dishwasher, no convenient laundry room, no modern appliances, chipped kitchen cabinets and old carpets) as excuses to create discouragement and neglect. This woman was a conscientious and diligent housekeeper long before she moved into the fine house. In the older home, she managed to incorporate the poor workmanship of floors and cabinets, into her homemaking, and do it beautifully. I once visited a young woman in Washington state, who lived in a house that was lent her by her grandmother. It was old and worn, and there was no plush carpet on the floor. She had no dishwasher and no dryer. She had only enough income for the bare essentials, yet inside, I noticed the threadbare towels neatly folded in one direction and stacked on a shelf. She had not let her lack of "things" and conveniences discourage her. Folding those mismatched, worn out towels, gave her a sense of order and dignity, and brought order to her life. Although she had children, the house was not strewn with toys and clothes. I wish I could show you a picture of this dismal looking house that she had made orderly and clean. In the early days of homesteading in Alaska, many families lived in tents until their houses could be built. Building a house took a lot longer, because the parents had to go into the nearby forests of their property and cut trees to make logs. Inside the tents, we had to be neat and orderly. Beds were rolled up in the day time in order to use them as seats. Our mothers even swept the canvas that served as floors. There were only a few dishes, and so the idea of them "stacking up to the ceiling" would have been ludicrous, for there was only one cup and one plate for each person. If mother got a bit behind on this, she would turn the plate upside down and serve dinner on the other side. After that, she simply had to wash them, but she often recruited one of her children to do it, while she did other tasks. If we neglect the basic elements of homemaking (dishes, laundry, clutter, cleanliness and order) , we end up in a vicious cycle, where piled up dishes and laundry make us feel discouraged, and discouragement makes us neglect the tasks at hand that make a house beautiful. When my children were growing up, they learned an important phrase, "Perspiration adds to appreciation." In other words, if they had to clean up something, they would be more protective of that particular area or thing, and not want it easily messed up. They were more likely to guard the home, if they had to clean it up. We are the same. If we have to keep up with the dishes, we will be more careful not to use them and leave them laying about in the kitchen. We'll be more particular about using a clean glass everytime someone gets a drink. (A Dixie cup dispenser is the best thing for that). If a child makes a mess and has to clean it up, he won't be so careless about making the same mess again. (That is, if the mother consistently makes him pick it up each time). I knew a woman with four daughters. Every month the housework was divided between the girls. One would take the living room, one the bathroom, and so forth. During that time, the girls owned the room they looked after. You can believe they took very good care of the room they owned, as they cleaned and decorated and arranged it all themselves. They were a lot more careful about how that room was treated. Homemaking is a lot like playing house. It has to be done cheerfully and creatively. We can understand how to learn new habits when it comes to something like piano playing or crochet classes, but somehow, we cannot translate that to home life. Learn, practice, learn some more, and practice, and soon, you are doing a job that at first was insurmountable. Everyone gets behind sometimes because of a rushed life. If this is happening to you, one suggestion I have is to clear your calendar of appointments and obligations for a week. Send someone else to the store for groceries, and decline to get in the car at all. Spend the week getting your house back into shape. If you have gotten way beyond this, you can hire someone to come in and give you a jumpstart by catching you up on everything. After they leave, do not let one single thing sit where it doesn't belong, for more than a few minutes. Walk around the house occasionally and scout for things that do not belong. Make children take all their belongings to their own rooms. Pick up your own things and put them where they belong. Clear the tables after you've had homeschooling or crafts, and neatly deposit everything in their assigned places. The only way a person who has had a problem with housekeeping can recover, is to become a fanatic for while, until better habits are formed. Keep the laundry caught up and put away, by doing a load a day. Keep the dishes done up after every meal and inbetween. Learn to cook with fewer pots and pans, and to mix things using fewer utinsels. For example, you can measure your dry ingredients in a large measuring pitcher, first, and use the same container for the wet ingredients next. Instead of reaching for a new bowl to mix something in, look in the dishpan and wash the one that has been used. Don't start the day without getting dressed. Pick it up, don't pass it up. Put things away as you go, rather than waiting for a cleaning day. Don't leave the house until it is cleaned up. I understand that there are some places on the web that send you emails daily to help you get started pulling yourself out of the accuulated mess, who have adopted the S.H.E. principles. Like the slob sisters, many women have had good mothers who were organized and clean and ran the home with great efficiency. However, many of that next generation spent most of their waking hours in schools and other institutions, rather than watching the habits of their mothers at home. Although their mothers were proficient homemakers, they were not able to pass on the habits to their daughters. My own mother had a wonderful garden, but I was so busy with homework and school, that I arrived home way past the time that I would have been with her out in the garden watching what she did. I consequently was not automatically a good gardner. The same applies to working inside the home to make it beautiful and orderly, and a place where you delight in staying. You've got to stay in it and work at it. Put on some nice music, spray a fresh scent into the air, and go to it. After all the hard labor, get a bath, dress up, and present your family with an orderly meal. You'll find the fussing and aggravation levels of your children go way down, once neatness and cleanliness are emphasised in the home. We can change our ways. We can be determined, we can learn new things, and we can submit ourselves to the tasks before us. I'll leave one small hint that helps me a lot. When I open a cabinet or drawer, or even the fridge, to get something or put something away, I look it over and if anything is out of place, I quickly straighten it. I never just get a glass and close the door. I always get a glass and then adjust something in the cabinet. Or, I use a spice and put it back, while re-grouping the spice area, and maybe wiping the inside where some things have been spilled. I launder my dishtowels and kitchen things by themselves in a load of wash, so that if I do not have time, I can simply take the entire load from the dryer and put it in a drawer. If I get around to folding them, I feel good, but at least they are in the drawer and pre-sorted by this method. When I am sewing, I will take breaks and clean up the area I'm in, folding patterns and putting them away, clearing the sewing area, and making a place for me to work. You may not need any of these hints, but they may give you an idea of things you can do to make living at home desireable rather than miserable. a town that does not have a place to have a proper tea. What has been the reason for this surge in interest in Afternoon Tea? One only has to attend one, in order to know they want to continue this custom. If you'd like to start the custom of tea in your own home, then start by attending as many teas as you can, both commercially and at the homes of other people. From this, you can get an idea of how to make your own custom of tea a unique experience that is custom made to your own preferences. Separate your planning into three areas: food, settings, and decor. For the correct manner in which to eat a scone, go here http://www.catteacorner.com/teadigest2.htm and scroll down to "other misconceptions about Tea." For the setting, consider using every tea cup and saucer you have in the house, rather than going out and buying new ones. If you can afford it, than go to it and buy the best you can and the style that inspires and delights you the most. The guests will be thoroughly uplifted and pleased when presented with dainty cups of your choice. Part of the attraction of Afternoon Tea is the way it is presented on the table, with the choice of cups, serving pieces and utinsels. Now is the time to use all those things that are not used daily, such as the cake server, the over-the-cup tea strainers, and the thin tea cups your grandmother left you. When I was a little girl, these cups and things were only used for "show" in a glass cabinet, and I never heard of anyone using them. It is good to see so many beautiful pieces on the market now. For a look at different tea sets, go here: http://www.someplaceintime.com/ You can also sign up for their seasonal newsletter which usually includes a tea menu. This site has some interesting things about tea parties http://www.nanapearls.com/teaparties.php This one has a tea service, and can actually send a box of foods and tea things to help you put on a tea yourself. I think that is a great idea for the frazzled lady who just has too much going on! This would be a good enterprise and ministry for some of the older homeschool families, particularly the girls. My sons did serve tea when they were teenagers, though, and enjoyed it very much! Decor requires special touches that make people feel festive. Things like streamers, balloons, flowers, and candles can help create the kind of atmosphere you want. A small indoor fountain, battery operated is nice on a side table, as the sound of a gurgling brook is very therapeutic and relaxing. The most important thing is that you get that water to a boil, and make sure it is hot enough to "cook" the tea bag and make the tea leaves expand so that the flavor comes out. There is nothing worse than a poorly made, tepid cup of tea. Allow tea to sit in the teapot and "steep" for five minutes before pouring. (The metal tea "kettle" is the thing you use to boil the water. You then pour it into the tea "pot" --in case you were confused.) The kettle is the one that whistles when the water boils, but sometimes you can get tea pots that play a tune when you pour them. Guests should be greeted with smiles and enthusiasm and then made to sit comfortably at the place you choose for them or the place of their choice, if that is what you, the hostess, arranges. The Tea Ceremony has an amazing atmosphere of both formality and friendliness. Usually, people talk a lot and enjoy each other's company at Tea more than any other time. One joy in the matter is that the hostess is using her best china and accessories for an ordinary occasion. In doing so, she is treating her family or guests like royalty. Children who experience Tea often while they are growing up, gain appreciation and refinement in their lives. Most people say they lack friends to have over for tea, but if they'll just look at what they do have, they'll find good company in their own children. All you have to do in order to see how popular tea parties are, is type in various words like "tea, tea party, tea and scones, " on the web and you'll be astonished at how many sites appear. I hope this trend truly stays put for awhile, and not disappears like it did in the middle of the 20th century, because it brings families close together and provides hospitality for church friends and relatives that is easily put together. I remember a time when all that fine china was kept behind glass doors, and no one used it. Since these people, now passed on, couldn't take it with them, these items ended up in estate sales and antique shops. Happily, many people are rescuing these lovely vessels and serving hot teas and herbal tea infusions in them. Contrary to popular modern myth, the homemakers of the 1800's had tremendous power. They controlled the direction of the family and often the success of the men, by the manner in which they conducted the home life and homemaking. A woman who practiced thrift and good management, did so partly because she knew it would help her husband be more successful at work, and make him more prosperous at home. 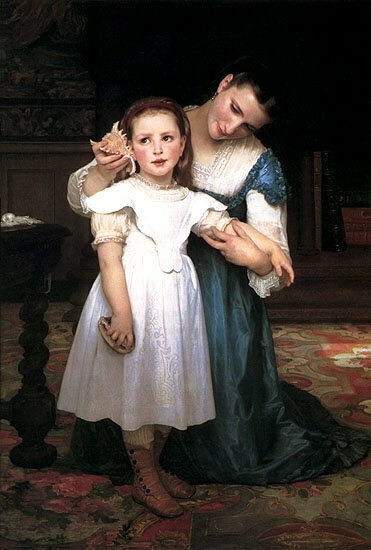 The homemakers of the 1800's thought it was scandalous if a woman left her home and her children in the care of others, because the influence of the wife and mother was keenly felt, and very important. When the so-called "Women's Libbers" came on the scene, the homemakers in general laughed them to scorn, for their backwards attempt at reconstructing the family and society by getting women out of their natural female role that since the beginning of time had suited women just fine. Queen Victoria herself said that the feminists "ought to get a good whipping," stating that if women left their roles of wives and mothers, men would no longer feel the obligation to take care of them. There never has been such a large population of single mothers, displaced homemakers, or broken homes. The downfall of the family unit (father and mother, children, husband and wife) contributes to the downfall of the nation. The strength of a nation depends on the strength of the home. This may be hard for people today, some who have never seen very many strong families, to understand. Families that love each other and do not "break up" are families that can not be led astray by false teachings and false "liberators," and families that will not abandon their noble purpose in life for riotous living. There are some things the homemakers of the past have left that we can look into to get a glimpse of their character. For example, their textiles (needlework, sewing and crafts), their art, diaries, scrapbooks, letters, household utinsels, furniture, dinnerware, and houses. The design and space of these homes give us clues about their manner of life. Many a person who has restored an old house of the 1800's has stated that they have felt a kind of contentment and inspiration while living in these old homes. The homemakers of the past didn't just live for their own pleasures of the day, but thought about how their actions would affect future generations. They knew that the memory of themselves in their descendents could influence them for the better. It was considered shameful for a woman to be a slothful homemaker. However, the homemaker of those times was not worn to a frazzle running around in a car all day, or over-extended on appointments and social engagements. They had more time to do their work, and were not concerned about so many of the things that women stress over today. I've gotten several feedback letters that indicate that people of certain economic levels cannot possibly reach the high calling of homemaking. These girls claim that because their people didn't have a good economic start, and weren't born with an inheritance, or didn't have rich parents, they cannot do anything with their lives. They are waiting for someone to compensate them for all these wrongs, and in the meantime, are wasting precious moments wallowing in self pity. I am not a rich person, have no personal income, do not live in a home of my own, and my ancestors left nothing for me to work with except good character. I had no inheritance, as my forebearers often did not live in more than shacks which eventually crumbled with time. We aren't who we are because of the material or educational opportunites that someone gave us, but because of certain character qualities we attain by learning and practice. Many people are searching for some peace in there lives, and others are waiting for someone to rescue them out of their troubles or their non-lives. Character is the only thing that matters in life, for it will determine what you do, how you respond, how you live your life daily, and your attitudes. No matter what your financial circumstances, you can develop in many other ways by discovering talents and abilities, that will take you far in life. If you feel you have nothing there, try just plain hard work. Many a poor person has begun working hard at a restaurant and later ended up owning the place. Our attitude about our circumstances should not be based on the thinking that someone owes us a living, or that we should be given something, or that we deserve anything. We are all here by God's grace, and our lives can be snuffed out at any given moment. Thinking that someone should give us something is selfish thinking. Turn your thinking around to a giving mode, and give something to someone else, instead, and you'll see your life changing. If you haven't got anything, there are still things you can give away: a smile, a parking space, give way and let others walk past, let traffic in, give your place in a line, give up your seat in a crowded area, give pleasant words, give compliments, write nice letters, build others up and praise them, etc. Saying you have nothing to give is not acceptable, because everyone has something they can give away. My husband and I once visted a tiny village in Rhodesia in the early 70's. A young couple invited us to eat with them in their grass shack. Inside, though the floor was made of packed dirt, it was as neat as could be and not one speck of dust. The woman was immaculately dressed, and very clean. Her food was cooked over a tiny burner but she made a delicious meal, and she smiled a lot. Her service was immensely gracious and her husband also adored her and was anxious to make their guest comfortable. Although she was not rich, this woman was a diligent homemaker. Contrast this to another woman in the same village, who did not clean and tidy her house. Rags and old papers were strewn everywhere and her children were dirty. In that village was a water supply for everyone, easily accessible, yet one woman used it and one did not. This is a matter of character, not of money or privilege in life. The world is full of stories about people who brought themselves out of nothing and made a good living, invented something, or raised up a good family. Education doesn't matter, and neither does money. While some of it is necessary, both the need for education and money are blown far out of proportion. Education comes from the willingness to learn, and if you are a learner, you can learn from anything, and not be limited to educational establishments. The education in those places is not thorough and does not equip you for life and godliness. It doesn't matter what our race or our economic situation: there is not one of us that cannot, by following the principles of the Bible, become good homemakers. The diligence described in Proverbs 31 applies to people of all kinds, not just some privileged person. Anyone can be neat, tidy, industrious, productive, diligent, good, kind, wise, loving, honest, and thrifty. Character qualities like self control and selflessness are highly prized. All of us are commanded to be servants. The attitude of service is the element that will make us successful in life; not money or privilege. After learning a bit about the effect of color on the mood of a person, I discovered why certain places I lived seemed to make me anxious, sad, lonely or depressed. In the 60's, when orange, gold and greens were all the rage in decorating materials (you could hardly get anything else), my home was furnished in these colors. I read that commercially, certain companies would use certain colors for their products and restaurants, based on the effect it had on customers. If they wanted customers to linger, they would decorate in certain colors. If they wanted people to buy on impulse, another set of colors was used. Advertisements are full of "selling" colors. Hospital rooms now are decorated in colors intended to calm and soothe the patients. I remember one home I lived where I woke up feeling anxious and went to be feeling anxious. I discovered certain activities where I was not anxious, and began to observe the elements of these activities: color, sound, scent, touch, sight, and weather. I found that the weather did nto matter so much if the interior of the home contained the kinds of colors that made me feel reassurred and happy. Since then, I've been more aware of how color affects the mood of people in the home. I wrote a little about this in an article on the Lady Lydia Speaks section of www.ladiesagainstfeminism.com called "Color in the Home," but there is much more too it than color. There are also many other things we need to pay more attention to in order to make the home more appealing. Flickering candlelight, soft music, and good smells from the kitchen must be combined with the kinds of colors that you like, to give the home the overall feeling of love and comfort. In a small country town, I met several young women who were deeply depressed. They said that coming to my home always cheered them up. I discovered that all these women had something in common: disorderly homes. This led me to the conclusion that order in the home contributes to peace of mind, a sense of well being, and a cheerful countenance. The women I observed who were happy, had in common the elements of order in their home. By order, I do not mean to imply that there was not a speck of dust in the home, or that the rooms did not have things laying around that could be put away. Rather, I mean that there was order in their routine, and the rooms functioned in whatever capacity they were meant for. The happier women at home were dressed well, well groomed, and were functioning at top level. They enjoyed the different times of day: Morning, Noon, and Evening. These were almost rituals to them. They seemed to know when it was time to do a certain thing. For example, noticing the fridge needed to be cleaned, they would make mental note of it and within the same day or the next, would clean it. The lounge room did not contain things that did not belong there. It was kept beautiful for drop-in visitors and for the family. Empty pop cans, chip bags, and plates of leftover pizza were not part of the living room decor. In the dining room, the table was cleared often for projects of various types, and even though things got a little messy, they were eventually gathered up and put away. The depressed women, on the other hand, were only happy and cheered up when they went somewhere else, where order exisited. I'm not denying the fact that a person can get themselves in clutter so deep that it is harder to crawl out of it, and it perpetuates depression. If you need a little help to get your home in order, don't be afraid to enlist it, or hire it. Sometimes Christian women who seem to have the knack for order, are just itching to get their hands on someone else's clutter, and straighten it out. Don't say no! Just watching such a woman can be inspiring, and her actions will teach you a great deal about managing the mess. Sometimes observing the way a room is kept in someone else's neat and tidy home, can help give you the jump-start you need to dig in and clean up your own house. You might ask the women you admire the most, for tips on how to get started, finish, and maintain your house. Lord willing this will be the first of many articles I write just observing the new culture God has put me in. We were coming home from prayer meeting the other night on the bus and I had another chance to watch my very out-going daughter in action. This is by no means unusual; I have caught Charity craning her neck to try to catch the attention of anyone within eye shot that she can smile at and charm. Most grandparent types just love her, and also younger women and even children sometimes can't resist her infant charms. This time, however, the person smiling and playing games with Charity didn't fit the usual stereotypes. It was a young man, probably in his early twenties. Most men that age don't acknowledge the presence of a person in need (i.e. the handicapped, the pregnant) let alone enjoy the company of a baby! I had only observed such treatment a few other times, and that was from Turkish young people. I didn't want to seem untoward, so after the young man exited the bus I asked my husband, "Was that young man Turkish?" Sure enough, my supposition was right, he was not a native German, but rather a Turk. These people leave their homeland not only for undeniable economic advancement, but also for family and religious reasons. In Germany they enjoy greater freedom to observe their religion than in Turkey and have the ability to provide for their family well. Although it is heartbreaking to know that the religion they devote themselves to is false and can only lead them to Hell in the end, I can't help admiring these people for their principles. They have a love of children and family that the West and even far too many true Christians have lost. Their young men and women enjoy and feel comfortable around babies and small children. In language class there always comes a day where the students share their dreams for their future. Practically every Turkish young person wants a spouse and children along with a good paying job. I can only assume that these people have been exposed to the joys and realities of family oriented life in a way that we have all but forgotten. I guess what I would conclude from this is that in general if we give our children a taste of the happiness that family and children bring, they are likely to carry that love their whole lives. Do Personal Circumstances Change the Meaning of the Bible? What if my husband gets sick? What if my husband doesn't make enough money to support me? What if I have talents beyond homemaking? Shouldn't I share them with the world? What about the women in Victorian times who had to work in the factories? What about the slaves in America? What about the slaves in Egypt? What about the serfs in England who had to work in the fields? What about Deborah, who was a judge, in the Bible? What about Lydia, who was a merchant? What about the prophetesses and the deaconesses in the Bible? What about poor women, single women, women without living parents? What about the women who became famous opera singers, authors or painters? What if I find I can't keep house? What if I don't want to be a homemaker? What if my husband makes me go to work? What if my husband refuses to work? What if my husband is lazy and will not work? What if I have children, even though I am not married? What if I don't have children, even though I am married? What will I do all day? What if the government sends all the women to work and all the children to day care? The list goes on and on, and as a young single girl, I can remember asking questions like this myself, just to sound very smart. Things change once your heart changes and you get married, and even those who have children and no husband, soon discover their minds changing about a lot of things. The presence of someone else dear to your life, will change your thinking in many ways. You are no longer thinking of "me" but of "we," and that makes a big, big difference. There is no way to answer every single little detailed question in objection to the idea of women being the guides and guards of the home, and the men being the providers. I don't care about what the slaves did in Egypt, and I don't care about the women in the factories in Victorian times, or the women in the work houses in Edwardian times. What I care about is what the Bible teaches women about how to live. All these scenes that everyone presents to me to trip me up, remind me of the Pharisees and their attempt to trap the words of Jesus. They were just trying to justify their actions and get out of doing what was right. If a girl really truly wants to do what is right and will bring the greatest blessings on her, and is concerned about having a long marriage and a good home and good children, she will pay attention to what the scriptures teach women to do. In a time when the non-believing women were loud and pushy and bossy and independent, the holy spirit told women to be busy at home. It was partly to make them different from the world and keep the word of God from being blasphemed, and partly because it is what is best for a woman's make up. We live in a nervous world today and it has increased since women went to work enmasse and left the comforts of the home. Yes, there were women who worked in saloons in the days of the wild, wild west, but there were Christian women who did not. There have always been women who managed pubs or worked every day in the market, but those who followed the scriptures knew that their place was in the home. Just because women working as harlots was mentioned in the Bible, does not give women the authority to do it. Christian women will always be different. Yes, there were women who were slaves, but those who were Christians, did what their Lord taught them to do: take care of their husbands and children and their own homes. So, in answer to the fact that women used to work, or that all women in your country work, I can say I am sure they do, but Christian women who believe the Bible and have a conviction, will follow what it says, not the dictates of the prevailing culture. No matter what state we find ourselves in, the Bible teaches us that the woman's greatest and most powerful role is as guard and guide of her home and family. That will never change, no matter what the economy does; no matter what the government does; no matter what the prevailing culture does. It is still possible to be all those things that the Bible teaches. You can give me the weirdest scenario, and I will admit there are always exceptions. Sure, Deborah was a judge, so is that teaching us to become career judges? Lydia was a seller of purple, so does that mean we all go door to door selling cloth? And yes, there were the slaves in Egypt. Does that mean we should all be slaves and go to work in other people's houses for minimum wage? We do know that the Egyptian women worked, for example, their midwives (who helped the Israelite women deliver their babies when Pharaoh told them to kill the babies), but we do not know for sure the Israelite slave women in Egypt worked. Many of them, such as the mother and sister of Moses, stayed at home and kept the home for their slave husbands. It is possible that even in the slave era in America, that many women stayed in their cabins having babies and fixing meals for their husbands in the cotton fields. It is impossible to prove that every single woman in the 19th century went to work because she was poor or because she had no husband. It is impossible to prove that every single woman has to go to work today just because her husband doesn't have a high salary. A lot of things that happened in the Bible were not commands of God, but recorded acts of mankind in rebellion. It showed the consequences of man's behavior when he went against God's principles. Just because there were slaves in Egypt, or Miriam complained about her brother, Moses, does not mean God approved of it. It just showed what happened. It showed the consequences of it. Many times God used such things to make people go in a different direction than they were going. Rahab ran a public house, and though she found favor with God for her heroic actions, it does not say that God approved of the way she lived, or that we should all become tavern keepers or harlots. The Bible tells the truth about people, but we have to be discerning about whether it is God's will for us all to be like the person in question. We have to read the circumstances around the situation and judge righteous judgement. We can not say for certain that on every single plantation that every single woman and child worked in the cotton fields. Every one was different, and there were some Christian plantations where women were treated differently. But whatever happened, it does not matter, because Christians with conviction will follow the inspired word of God. We do not know a lot about the circumstances surrounding these people in the Bible. For one, how old was Deborah? Did she have children at home? Was she neglecting her husband, or did she have a living husband? Was she all alone in the world? It does not matter, because the women who follow the scriptures, will do what God says do, and live by faith, not by sight. As for whether your husband turns out to be a bum who will not work, Christians know that a man who will not provide for his own is in rebellion. His family will starve and it will be a shame to him. The church is supposed to discipline him. The wife should go back to her parents if her husband will not provide for them, as they did in the past. I knew several girls who took their children and went home to their parents when the husband began drinking. But you can prevent this if you will not marry a man who drinks. If he is lazy before you marry him, marriage won't motivate him for long. He doesn't give us scriptures like, "The young women should marry, bear children, keep house...giving no occasion for the enemy (not bringing reproach and criticism by being a bad housekeeper)," and then make circumstances that are impossible. As in every society and every era, there will be women who will leave their homes and their children and husbands and go to work for money, but that is not a standard for the Christian woman. The Christian woman will do as the scriptures teach (see Titus 2, which shows what the younger women are to be taught). Christian women sometimes find themselves in temporary situations that are not ideal, but they always have a goal of getting as close to the standard as they can. We hold up that ideal in our minds and look to accomplish the goal of the high calling of Christ. Taking care of our houses and our children and our husbands is a high calling. If you have a dream and you set your course, you will likely follow it. If you get started in a different direction, you can get trapped working forever, as many women will testify. You can always find exceptions, but Christian women will be different. That is the bottom line. Yes, there were women in pioneer days who did not stay home, but they were the exception, not the rule. Christian women knew they had a duty to do at home and in the church. It doesn't mean they stayed in the house all their lives. We are all free to come and go as we need to. Home makers are freer than working women and not tied down to strict schedules. They contribute a great deal to the churches and to the world because of their flexibility and creativity. The blogs show this to be true. There has been an attempt in the last few years, even by ministers and teachers, to make the Proverbs 31 woman into a real estate agent and a merchant and a full time weaver. They miss the entire principle of the passage: that she was busy and she cared for her own household and that she taught the things that were good and right. In making her into a career woman, these people put tremendous burdens on young women, who need to be content as wives, mother and homemakers. In the past, when the passage was taught, it was taught as a guide for women to be keepers of the home, finding the best food and making good things for their families. Now, it is taught as an excuse for women to neglect their little ones and compete in the market place. Women have always worked from home, and always made extra money, but the pressure now is to get them completely away from the family and out of their home for 8 to 10 hours a day. Women who follow God, will look at this chapter with a yearning to be homemakers, not a yearning to sell girdles in the marketplace. Those who follow the scriptures will do so with a discerning heart, not trying to twist them to suit their own will. There is an old saying that people try to change the Bible to fit themselves, instead of changing themselves to fit the Bible. Titus 2, I Timothy 5:14, Genesis 1 and 2--the purpose of men and women established. Proverbs 31. If a person has a personal conviction deep enough, he can find a way to follow that conviction. If he cannot follow his convictions, it shows that they were not convictions, but preferences, which change with the winds of adversity. When things are convenient or easy, he finds a way to do want he knows to be right, but when it becomes difficult, he finds a reason he cannot. "One who wants, finds a way. One who does not want, finds a reason." I was visiting an antique store and observing with interest some of the detailed home furnishings and housewares. A baking pan, such as a pie plate, was so beautiful, that even without a pie in it, would be a pleasure to look at sitting out on the counter. Inside the plate was painted a bouquet of flowers. Teacups not only had designs on the outside, but, as you drank the tea, scenes of cottages or roses appeared. Kitchen and bath towels bore embroidery depicting various chores being done cheerfully--i.e. Monday showed a little girl dressed in a pinafore hanging up laundry, and Tuesday showed a girl baking, etc. The bath towels had bits of satin sewn on the edges. I would have thought these were used only for show, but the appearance of thin areas, holes and stains, showed that they were well used and loved. Aprons were not plain, either, for many of them were crocheted and had a rich, lacy look. My friend and I were talking about this and comparing the amount a beauty that a woman at home used to work with, to the things that have been used in the past few decades that are so plain. In comparison, also, the nature of women in former time seems to have been more optimistic. We both had read many true accounts of women overcoming, cheerfully, hard times. We discussed doing a type of case study by putting women in a house for a week that was extraordinarily utilitarian, and other women in a house that was decorated with cheerful colors and details on the things they used, and then comparing their attitudes and moods. We don't have to really do that, though, as all we have to do is observe ourselves in the same situations. Those of us who have worked in various institution-type businesses know that there is a big difference between the office and home, when it comes to beauty and comfort, and that it effects our moods a great deal. The soft details of the home satisfy a great longing of the soul for things that are beautiful. When we see beauty every day, it feeds our minds with something positive. On the other hand, if the mind is fed only ugly dullness day after day, it can cause much depression. If a fresh bouquet of flowers will make a woman's day, then I say, go for it. As I've gotten older, I've been trying to simplify my housekeeping by not going so much to yard sales and buying things I like that I'll just have to put somewhere, clean, dust, etc., so a bouquet of fresh flowers just meets my needs. It satisfies my desire to go shopping, gives immense pleasure to those around me, and beautifies the home. Upon arising, do not leave your room or bathroom until you are ready to "face the nation." This means that you are fully dressed, hair in place, wearing shoes, and well groomed. Even if "all" you are going to do is stay at home, prepare yourself as though you were called out. There is a hidden meaning in that phrase "called out." It means to come away from the ordinary, petty cares and to be prepared for life on a higher level, spiritually. In a way, dressing up for the day lifts your expectations of yourself and helps you to function more efficiently, or professionally, at your work. There are many people who make housekeeping their career. They have to wear a certain uniform and keep certain hours, in order to get the job done. Dressing for the day sets the tone of the atmosphere for yourself and your family. It says, "This is a special occasion," or "What I am doing is important." At the risk of boring you, I'll repeat what someone once told me about dressing up for the home. She said she noticed an amazing difference in her accomplishment and her organization, once she began to put on a nice skirt and shoes, etc., but later on in the day she decided to wear her old grunge outfit of sweats and sports shoes. After that, the day went completely downhill. Clutter began to accumulate, and chaos ensued. Her husband and children were cranky. She said she saw a real difference when she decided to get ready for the day, and dress well. In dressing up, I certainly do not mean you wear the outfit you wore to your friend's wedding, or a prom dress. I mean clothing that looks suitable for going to the store at the spur of the moment, but can be worn in the home for the daily function of the home. Most people find skirts and blouses the best choice for this. Dressing up at home means that if suddenly you are called out, you do not have to take extra time to put on your shoes, change your clothes, comb your hair or wash your face. It means that you'll be more time-efficient. The home is the highest office in the land. It is the place where bodies are fed but souls are taught, and where values are formed, if the mother is taking the time to tend to the spiritual training of her children. Even without children (mine are all grown now), the woman sets the tone for the home, by her attitude toward it. Dressing up can go a long way to keep her spirits high and her goals meaningful. Every time you are in a room, go around and straighten it up. Better yet, don't drop things casually in places they don't belong. You'll only have to pick them up later. Dishes can be collected in the sink, until you have a large enough load to warrant washing. Just keep the top of the cabinet top free of dirty dishes, and you'll feel more optimistic about the job. If you do a load of laundry every day, you are more likely to keep up with it and not get overwhelmed, than if you save it up and do it all at once. Before you leave the bathroom, clean it up. Wipe the sink, faucet and mirror. After a bath or shower, wipe the tub and walls with a wet cloth and a little soap. Fold and stack things orderly before you leave that room. If you will clean your bedroom and get dressed and ready for the day before you even leave that room, you will find that homemaking is a pleasure and living at home is relaxing rather than stressful.